In this book, child psychiatrist Scott Shannon offers a refreshing new path for practitioners who are eager for a more optimistic view of children’s mental health, one that emphasizes a child’s inherent resilience and resources over pathology and prescriptions. “What is mental health?” Shannon explores the fundamental question, showing that an innate desire for balance—a wholeness between brain-body-mind lies at the heart of wellness. Such a balance can’t be achieved by medication alone, but requires a broad, full-spectrum understanding of children’s lives: their diet, social skills, sleep habits, their ability to self-regulate, to find meaning and purpose in life, and their family relationships. Stress, trauma, and poor nutrition are some of the most common barriers to wholeness in kids’ lives, and Shannon carefully examines these and other barriers, and what the latest discoveries in neuroplasticity and epigenetics tell us about their ability to overcome them. Readers will learn how to perform a different sort of assessment—one that identifies patterns of imbalance and obstacles to health in a child’s life—as well as how to build a meaningful, effective treatment plan around these deficits, and how clinicians can best position themselves to respond effectively. 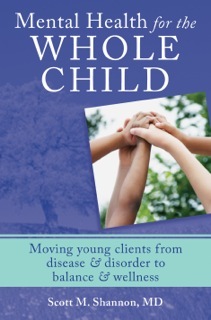 The second part of the book looks at eight of the most common childhood mental health issues—ADHD, depression, behavioral problems, anxiety and OCD, bipolar disorder, substance abuse, autism spectrum disorders, and trauma and PTSD—and a variety of effective complementary treatment tools for each, including dietary changes, nutritional supplements, specific cognitive or behavioral therapies, parenting interventions, medications, and more. Step-by-step treatment plans are included to guide clinicians on how best to approach each presenting problem. Mental Health for the Whole Child combines modern science, cutting-edge psychology, integrative medicine, and clinical wisdom to offer all professionals who work with kids a new, more hopeful way forward.